When my husband received the opportunity to get tickets to the African American museum the day of his birthday, it really was a no-brainer that we would be taking a trip to Washington D.C. this summer. Instead of making it a one day trip, we decided to make it an extended weekend/babymoon trip. It became a 2 for 1 deal! Now don't think this is our first time in "Chocolate City," as we normally come here to visit and stay with friends. This time we wanted a real "away from home experience", since it would be our last trip as a twosome. We decided to stay at the Kimpton Donovan hotel located on 14th st Corridor. We picked this hotel for its location, charming amenities, and one of the best views of the city. Buffet Breakfast that began at 7am. On our vacations, good food is always a priority. It doesn't always have to be the fanciest restaurants. We just enjoy flavor, ambience, and quality service. 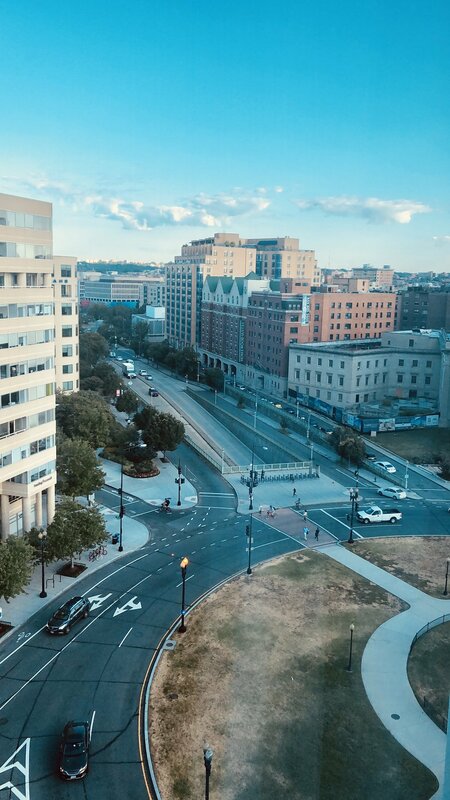 We recommend the following eats during your time in D.C.
Joe's Seafood, Prime Steak & Stone Crab - I took my husband here for his birthday dinner. The food was absolutely amazing! It was in a convenient location (only a 15 minute walk from our hotel). Highly recommend the stuffed mushroom appetizer and the crab cakes. They are also know for their oysters, but I'm pregnant so that was out the question. JINYA Ramen Bar - I don't want to say this is the best ramen place I have been to. But it is the best ramen place I have been to!! We actually found this place accidentally while looking for lunch before heading to the museum. You must try the truffle brussel sprouts. El Centro D.F. - a favorite brunch spot for me in D.C. First, because I love Mexican food. Secondly, who doesn't' love unlimited food + drinks for 2 hours! For $35 you get your choice of unlimited tapas and drinks of choice. As I mentioned the Smithsonian museum African American History and Culture was top of our list to visit during our stay. It did not disappoint, with 6 floors of African American history. I experienced almost every emotion possible during the 5 hours we were there. Also got a chance to visit the new Oprah exhibition that opened up. My husband and I have a tradition of going to the aquarium in all the cities we visit. Since there was none in DC, we opted for the Smithsonian’s National Zoo. It is free to enter and the grounds are extensive. Park: Their happy hour food + drinks (per my husband) were the best. Order the jerk wings and it comes with Mac & Cheese for only $7! Add on a dessert after you’ve drunk enough for $2. I say go with the bread pudding. Marvins: Laid back vibe with great tunes. Rosebar: Perfect if you’re looking for a bit of a turn-up. Board Room: Saturday rained all day. We decided to take our “stay inside” mood to a place that felt like a house party. Bringing back nostalgic board games like Trouble, Clue, Guess Who, and a grueling game of Scrabble. There are so many great bars to pop in and out of along U Street, 14th street, and K street. Our hotel at Kimpton Donovan was conveniently located near all these destinations. Overall the trip was amazing. I always enjoy going away with my best friend and try to balance a bit of what we both enjoy on vacation. Stay tuned for my post on travel essentials that got me through the weekend. Have you visited D.C. before and are there any places you recommend?